Which image would you say encapsulates Eleusis? If you had to choose one object to represent the city, where would you turn? The artisans and the artists who were entrusted with the responsibility of selecting images for the banknotes of the Greek state turned to the large marble relief that had been discovered in Eleusis in 1859. It has been traditionally interpreted as depicting the goddess Demeter offering Triptolemos the sacred ears of wheat that will be her gift to humanity. Her daughter, Persephone, blesses the young hero with her right hand while holding a large torch in her left. This marvelous product of a classical Attic workshop has been selected twice in the history of the modern Greek currency to adorn banknotes, while Demeter also appeared in various configurations. Ancient Greek gods and goddesses were a steady source of inspiration for Greek banknotes almost from the very beginning. The state seemed to attempt to connect modern Greece with the glorious classical ancient past without references to the interim Byzantine and Ottoman periods. Hermes, the messenger of the gods and patron of merchants and commerce was an obvious choice. The goddess Athena was equally popular through her association with warfare and as a patron of crafts, artisans, and human creativity in general. The third choice is Demeter, the goddess of agriculture and fertility. She made her first appearance on the 1000-drachmas banknote that was issued in the summer of 1922. Demeter was depicted seated on a majestic throne surrounded by grain and farming equipment. These banknotes were printed by the American Bank Note Company to replace the paper currency that had been cut in half by order of the Greek Minister of Finance Petros Protopapadakes. This was a curious and radical measure adopted by the government in the spring of 1922 in an effort to raise funds for the maintenance of the army that was fighting in Asia Minor. The notes were cut in half; the left side bearing the portrait of George Stavros (founder of the National Bank of Greece) continued to serve as currency at half the value printed on the banknote, while the right side bearing the royal coat of arms became a bond to be redeemed by the state in twenty years. Demeter temporarily disappeared from circulation when the 1000-drachmas banknote was withdrawn from circulation on 18 February 1931. In 1934 the director of the Bank of Greece, Emmanuel Tsouderos, placed an order with the Bank of France for a new issue of 50 million banknotes. Tsouderos wished to promote the commerce, merchant navy, and the agricultural sector of Greece without discarding the traditional association with the classical past. The design was inspired by the Art Deco movement and was the work of the French painter Sébastien Laurent, but Tsouderos did not hesitate to express his artistic opinion. The 50-drachma note depicted a countrywoman on the front and the relief of Demeter with Triptolemos and Persephone on the back but Tsouderos thought that the woman looked more like an exhausted bourgeois housewife than an indefatigable peasant. As for the reverse side, the Bank made sure that Laurent received a photograph of the original relief from the National Archaeological Museum in order to avoid any errors in the reproduction. After much work, the design was approved in December 1934 and 25,000,000 notes were put in circulation. While Demeter and her daughter adorned the banknotes, the Greek economy suffered a series of crises that culminated in the disastrous consequences of the Second World War and the subsequent civil war. During this period the drachma was very unstable, and hyperinflation threatened the livelihood of most citizens. The solution was finally sought in the drastic devaluation of the Greek currency against the US dollar. 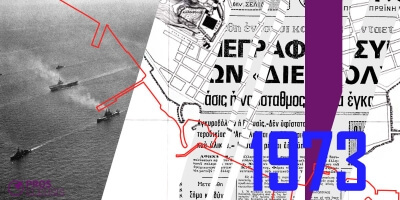 On 9 April 1953, the dollar exchange rate rose from 15,000 to 30,000 drachmas, a move that ushered into twenty years of stabilization and growth for the Greek economy. A year later the government decided to remove the last three zeros from the denomination and launched a series of new banknote issues every 10-15 years. The issue of 1964-1970 consisted of banknotes of 50, 100, 500, and 1000 drachmas. These banknotes were adorned with a series of seminal works of ancient Greek art and architecture, including the head of the acclaimed Artemision Bronze (representing either Zeus or Poseidon) and the theater of Epidaurus. 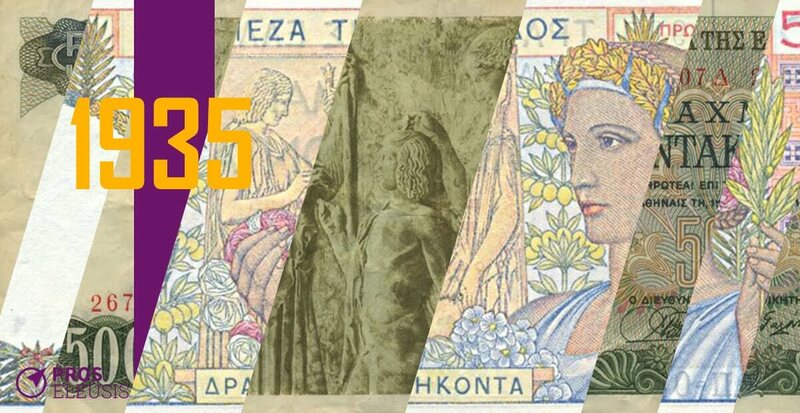 On 17 March 1969, the Bank of Greece circulated olive-green coloured 500-drachmas banknotes that marked the reappearance of Demeter. The front side depicted the celebrated marble relief of Demeter, Triptolemos, and Persephone. The major difference with the 1935 issue was an effort to highlight the marble texture of the original work of art. The back side showed grapes, olives, and the famous suckling wild goat faience plaque from Knossos. The bank issued approximately 252,000,000 500-drachmas notes before they (and Demeter) were once and for all withdrawn from circulation in January 1988. I liked it; I'll share it! Bregianni, Catherine. “Printing of banknotes of the Bank of Greece by the Bank of France (1934-1936). A description of interwar banking practices.” Numismatic Chronicles, vol. 28, 2010, pp. 105-127. Fysikas, Evangelos. “The last five issues of the Greek drachma before the adoption of the euro.” International Bank Note Society Journal, vol. 54 (2), 2015, pp. 8-16. Harrison, Evelyn. “Eumolpos Arrives in Eleusis.” Hesperia, vol. 69, 2000, pp. 267-291. Monestier, Martin (1983). The art paper currency. London: Quartet Books. Smith, Michael Llewellyn (1998). Ionian Vision: Greece in Asia Minor, 1919-1922. London: C. Hurst & Co. Publishers. The stories of Eleusis in your inbox! Subscribe to our newsletter and read them before anyone else. 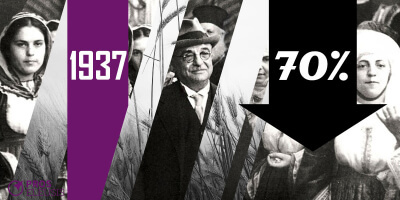 “The roots of the nation lie in the fields […], for the present generation of Greeks […] it is necessary […] to thicken the nation’s rural roots […] and to intensify to the utmost limit the exploitation of agricultural resources”. Thus spoke the Minister of Agriculture of the Metaxas government in January 1937. At the beginning of January 1973, the Greek press proudly announced the signing of an Hellenic-American home porting arrangement for a task force of the United States Sixth Fleet. 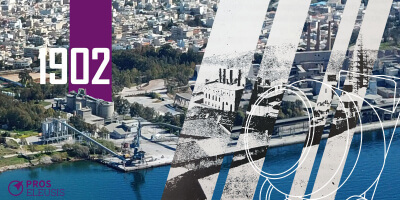 In the early 20th century, Eleusis was at the forefront of industrial development. The abundant (and inexpensive) land, the opening of the Corinth Canal, the Piraeus-Athens-Peloponnese railway line and the port of Eleusis had transformed the city into an ideal location for the founding of new industries.